Any supposed news about release dates or delays for Aliens: Colonial Marines is completely made up, says Gearbox studio head Randy Pitchford. Gearbox hasn't announced a release date for its squad-based, sci-fi shooter Alien: Colonial Marines. In fact, it's not said anything about the game's release at all, despite reports claiming that there was no chance of it coming out in 2011. 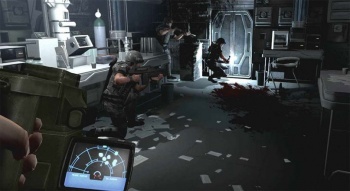 Work on Aliens: Colonial Marines began in 2006, and Sega originally planned to release it in 2008. That plan went a little awry however, as more than two years past the supposed release date, the game is still yet to appear. The idea that the game wouldn't be coming out in 2011 either started in a thread on the NeoGAF forums, where a poster summarized information from an interview Pitchford had given EGM. A few news sites picked up on this little tidbit, but in a statement to Eurogamer, Pitchford was adamant that he'd said nothing about the Colonial Marines release date. Pitchford said that while he hadn't seen the interview in question yet, he was sure that all he had said about Colonial Marines was that he was excited about it, and that Gearbox was committed to making it great. He was pleased that people were so interested in the game that stories about release dates and delays appeared "literally out of nowhere and from nothing," and was looking forward to replacing rumor with concrete details in the near future. Back in October, Pitchford said that it wasn't that Colonial Marines had really been delayed, but rather that Sega had announced it much too soon. Hopefully the game will come out soon, because the idea of a fighting hordes of Xenomorphs with a few friends sounds like an absolute blast.